Hey guys and welcome to my little blog home!! 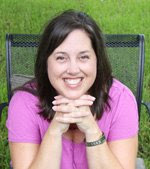 This is my first time participating in Papertrey's "Blog Hop Challenge" so here we go!!! For this month's project, I decided to whip out some of my most favorite and yummiest Papertrey patterned papers, along with a few solids. You simply can't go wrong with any of Papertrey's products....honestly, they are all my favorites. How about you? To begin the body of my owl I grabbed my Dark Chocolate cardstock, and stamped it using my Tin Types background stamp and my Versamark ink pad. Next, I cut small strips of random paper from my Bitty Box Basics pad, along with my Dotty Biscotti pad as well as my Bitty Dot Basics pad. I then used my scallop-edged scissors on the ends of each paper strip. After I adhered the rows of paper strips, I rubbed each edge with my Chai ink. To give my cute owl her face, I used two circle dies along with my Polka Dot Basics II stamp set and my Dot Spot stamp set. I added "eyelashes" using a few silk flowers from my stash. To finish her eyes, I used a glue dot and attached two large brown buttons. A piece of Bitty Box Basics paper was cut in a triangle to resemble an owl's beak. I also gave it some dimension using foam tape. To complete "her" body I used my Papertrey rickrack die, a bit of rustic twine, a button and more Chai ink. I added a sentiment to the bag using a Spellbinders tag die, my Woodgrain background stamp set and the "Picture This" stamp set from Stampin' Up. I can't wait to fill "her" up with some homemade goodness and surprise someone's day. I hope you enjoyed my little project! Ahhhhh....way too cute! Love all the paper at the bottom of the bag! Very creative! You owl's eyes are just too cute! OMG, pinch me! :) I am so in love with everything owl this is just amazing! Sooo great! Welcome to the hop! This is TOO CUTE!!! What a lot of work, but well worth it. Well this is just cute X 10!!! LOVE it!! This is so darn cute. I love every thing about this OWL... really super fun!!! 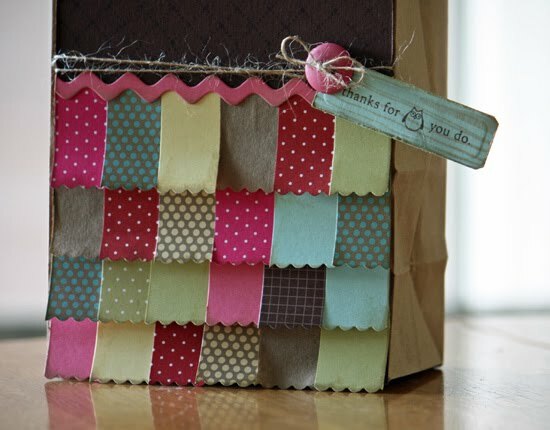 what a cute way to dress up a gift ( and use up all of your patterned paper scraps!! This is too cute!! I might have to scrap lift this idea!! This gift bag is adorable! You really spent some time on this.....all the details especially the strips of paper at the bottom. Great job! This is absolutely adorable! I love all those scallops and the eyes of the owl are perfect! Cute!!!!!!! Love the eyes especially! Your project is absolutely adorable! Awww.... this is so super cute, I am smiling from ear to ear, love it! Oh my gosh! I LOVE this cutie!!! This is really cute. I actually thought you used fabric for the squares at first, it looks that good. Great idea and the tin type was the perfect choice for it too. And what a lovely owl she is! Great job! This gift bag is so cute. Adorable!!!! Thank you for sharing. This will make someone's day. Seriously!! This is too stinkin' cute! I LOVE it! Love your owl bag. So colorful. oh my gosh, is this one cute paper bag!!! This is so adorably cute! Love those eyes! Great project. Oh so cute!!!! What a creative project!! You totally rocked this challenge!! So cute I might hyperventilate! At least there's a super cute bag around if i do! I am so going to have to try this! Bravo!!! This is darling! What a great gift bag! Send my dentist a check because I just got a cavity from THE CUTENESS of it all! 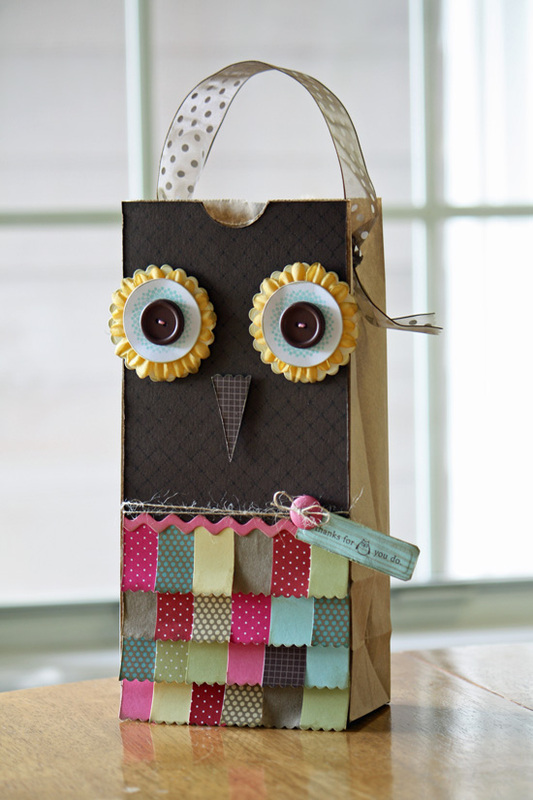 I LOVE how you turned the bag into an owl with big ole eyes and those cute ribbon tab feathers! TOTALLY creative fun! Get out of town! That is so cute! This is way too cute!!! I love it!! I really like how you did his feathers at the bottom!! GREAT idea!! This is just DARLING! I LOVE it!!! Have a GREAT day.. Happy Hopping! This is just too clever! Love the layered feathers! Totally BRILLIANT & CLEVER and sooo A-D-O-R-A-B-L-E in every way!!! So totally cute! What an awesome idea! Gorgeous - LOVE the bottom!!! Adorable!! Love the look and the little sentiment. Well done. So ADORABLE! Really put a SMILE on my face!!! So darn cute! 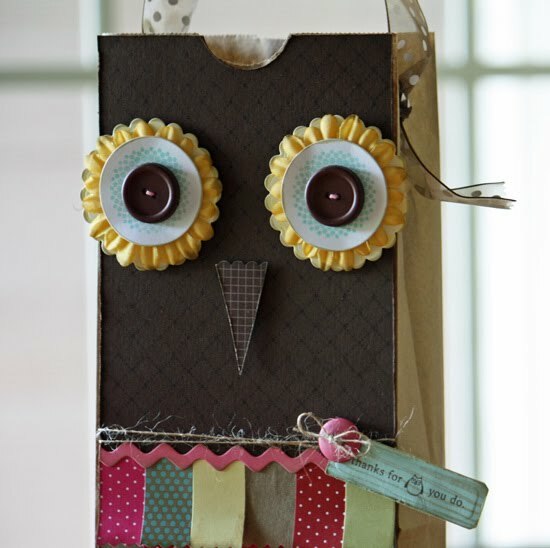 I bet it puts a big "owl" smile on the recipient of such a cute gift bag. Nevermind the goodness you fill it with - the outside is quite adorable. So creative and cute-love your owl bag! Love your little owlie. I love the colors. It's adorable! Glad you were able to join in this month. Super cute!